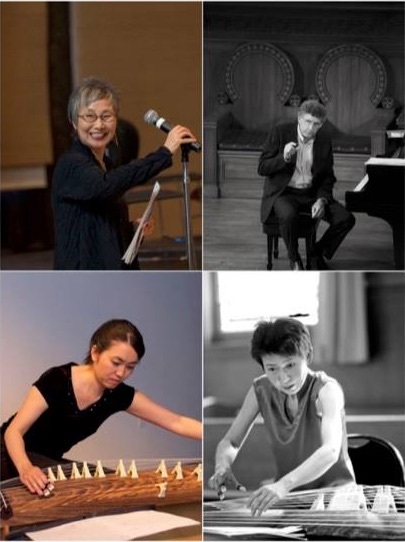 One of the highlights of the launch of the new season at the Center for New Music (C4NM) will be a program of original koto music composed by Hyo-shin Na. Na has prepared a program consisting entirely of duos, which will be performed by her colleagues in the Wooden Fish Ensemble, Thomas Schultz on piano and Shoko Hikage and Yuki Yasuda playing both koto and bass koto. Na will provide commentary for each of the works that will be performed. The titles of Na’s compositions follow the same descriptive simplicity often encountered in the works of Morton Feldman. Thus, the program will begin with “Koto, Bass Koto” and “Koto, Bass Koto II,” the latter receiving its world premiere; and it will conclude with “Koto, Piano” and “Koto, Piano II.” The central work on the program will be “Koto Music,” which will be performed as a koto duo. This concert will begin at 3 p.m. on Sunday, September 10, and is expected to last about three hours. C4NM is located at 55 Taylor Street, about half a block north of where Golden Gate Avenue meets Market Street. General admission will be $18 with a $12 rate for C4NM members. Tickets will be available at the door and may also be purchased in advance online through a Vendini event page.